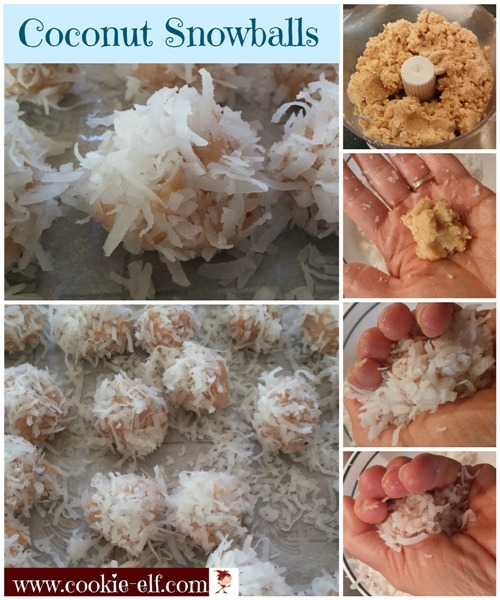 Coconut Snowballs are easy to make. But what makes this no bake cookie recipe so much fun is “rolling snowballs” with the dough. Your fingers don’t get cold! They're a good recipe to make with kids in the winter. No oven, hands on, and only 4 ingredients. Line a baking sheet line with waxed paper. Set aside. Using a food processor with a steel blade, crush the vanilla crème sandwich cookies until finely ground. Set out a piece of waxed paper on the work surface. Place the bowl of dough and the remaining shredded coconut within easy reach. Now comes the fun part: roll the cookie dough into snowballs! Working over the covered surface, place 1-2 tablespoons of coconut in the palm of your hand. With the other hand, break off a small piece of cookie dough, about the size of a kitchen teaspoon. Set the dough into your palm full of coconut. Sprinkle the top of the piece of dough with another 1-2 tablespoons of coconut. Squeeze the cookie dough and the coconut together and roll the dough into a ball, allowing the coconut to coat its exterior. The excess coconut (snow) will fall on the waxed paper surface. Set the coconut snowball on the prepared baking sheet. Repeat “rolling snowballs” until you have used all the “snow” (cookie dough). Chill balls in the refrigerator until firm, about 30 minutes. Store balls in an airtight container in the refrigerator with waxed paper between layers. Children love to roll the cookie dough in coconut into snowballs, yet the process with them may be messy. Protect them and your kitchen before they start work by having them wear aprons or smocks. Have extra coconut on hand when preparing this easy cookie recipe with kids. If cookie dough is too loose or too sticky before rolling it into snowballs, set it in the refrigerator for about 30 minutes. The dough will become stiffer. No Bake Oatmeal Cookies: easy, healthy, just 5 ingredients! No-Bake Samoa Cookies: Just 6 Ingredients!